NEW YORK--(BUSINESS WIRE)--Nov. 20, 2018-- 2K and Firaxis Games announced today that Sid Meier’s Civilization® VI: Gathering Storm, the second expansion pack for the critically acclaimed and award-winning Sid Meier’s Civilization® VI, will be available for Windows PC on February 14, 2019. Civilization VI: Gathering Storm will introduce an active planet where geology and climatology present unique new challenges. Players will build new Engineering Projects, manage their cities’ Power and Consumable Resources and work with other world leaders in the World Congress to deal with the challenges presented by the dynamic forces of nature. This new expansion also extends the Technology and Civics trees with a future era and adds nine new leaders from eight new civilizations, a new Diplomatic Victory condition, a variety of new units, districts, wonders, buildings and more. Developed by Firaxis Games, Sid Meier’s Civilization VI is rated E10+ for Everyone 10 and up by the ESRB and is available now for Windows PC and Nintendo Switch™. Sid Meier’s Civilization VI is also available for iPhone, iPad, Mac and Linux from Aspyr Media. 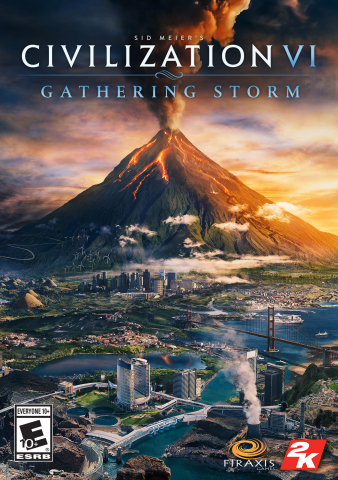 Sid Meier’s Civilization VI: Gathering Storm will be available on February 14, 2019 for Windows PC and coming shortly thereafter for Mac and Linux from Aspyr Media. For more information on Sid Meier’s Civilization VI, visit www.civilization.com, become a fan on Facebook, subscribe on YouTube, follow Civilization on Twitter and Instagram and join the conversation using the hashtag #OneMoreTurn. Firaxis Games™ is one of the world’s premier game development studios, and home of legendary designer Sid Meier. Firaxis has developed some of the most successful and award-winning PC and video games on the market today, including the award-winning Sid Meier’s Civilization® series, featuring the recently released Sid Meier’s Civilization VI, for Windows PC, Sid Meier’s Civilization: Beyond Earth™ for Windows PC, the expansion pack Sid Meier’s Civilization: Beyond Earth – Rising Tide for Windows PC, Sid Meier’s Civilization V for Windows PC, as well as the critically acclaimed expansion packs, Sid Meier’s Civilization V: Brave New World and Sid Meier’s Civilization V: Gods and Kings for Windows PC. Firaxis also released the 2012 Game of the Year award-winning XCOM®: Enemy Unknown for Windows PC, the Xbox 360® video game and entertainment system from Microsoft, PlayStation®3 computer entertainment system, and Apple iOS, along with the critically acclaimed expansion pack XCOM: Enemy Within for Windows PC, the Xbox 360 video game and entertainment system from Microsoft, PlayStation3 computer entertainment system, and Apple iOS. Firaxis Games is owned by Take-Two Interactive Software, Inc., and is part of its 2K publishing label. For more information about Firaxis and its games can be found at www.firaxis.com.